3 Years Is Too Long! June 25, 2009 will be the 3rd anniversary of the kidnapping of Gilad Shalit. 3 years of being a POW. Yet in his case the International Red Cross is not allowed to visit, the world’s media (excluding the media in Israel) is silent, and the leaders of the world are more concerned with recognizing Hamas (the kidnappers) and not one lone Israeli soldier. Why doesn’t the fate of the Israeli soldier Gilad Shalit trouble you in the same way as the fate of the Guantanamo prisoners? But during the two years Shalit has been held by terrorists, the world human rights community has done nothing for his release. Why? He is a wounded soldier, and fully falls under the protection of the Geneva Conventions. The Conventions say clearly that hostage-taking is prohibited, that representatives of the Red Cross must be allowed to see prisoners of war, especially wounded prisoners, and there is much else written in the Geneva Conventions about Shalit’s rights. The fact that representatives of the Quartet conduct negotiations with the people who are holding Shalit in an unknown location, in unknown conditions, vividly demonstrates their scorn of international rights documents and their total legal nihilism. Do human rights activists also fail to recall the fundamental international rights documents? And yet I still think (and some will find this naive) that the first tiny, but real step toward peace must become the release of Shalit. Release – and not his exchange for 1,000 or 1,500 prisoners who are in Israeli prisons serving court sentences for real crimes. 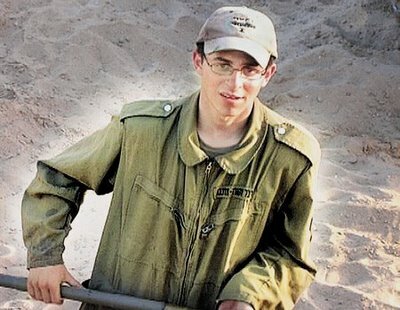 Returning to my question of why human rights activists are silent, I can find no answer except that Shalit is an Israeli soldier, Shalit is a Jew. So again, it is conscious or unconscious anti-Semitism. Again, it is fascism. Gilad Shalit is a Jew. That is why the world accepts Hamas’ continued captivity of Sgt. Shalit. Dr. Bonner saw the truth, when will the rest of the world see it. Dhimmi Carter has suggested to President Obama that Hamas be taken off the terror group list. Perhaps President Obama do so when and if Hamas releases Sgt. Shalit first. It would be a gesture on Hamas’ part that they are willing to become civilized and follow international law. Until that they must be kept on the terror group list. Not once during President Obama speech to Muslims that he gave in Egypt did he mention Gilad Shalit. Not once. Isn’t it about time that he did. Let us all make Thursday Gilad Shalit Day. It is time to bring Sgt. Shalit home. Let it be soon! Filed under: Gilad Shalit, Hamas, Israel. International Red Cross, POW, Twitter |	Comments Off on 3 Years Is Too Long!